Croutons and beer in a dessert? Yup! I like to think of this as an ice cream sundae all grown up. It contains everything I want in a fall dessert in a shot glass. The pumpkin ice cream is silky, and all the spices add a warmth to it. The addition of bourbon adds a nice little kick giving the ice cream another layer of flavor that leaves you wanting more. It is divine all on its own, but why would I stop there? Beer caramel sauce is so good, just give me a spoon and we’ll call it a day. This is a big statement coming from me because I don’t drink beer, but i do love to use it in cooking and baking. All I know is when you start a caramel sauce by reducing two bottles of Sam Adams Octoberfest something magical happens. I used Sam Adams Octoberfest which is a dark spiced ale because it has a richness that I knew would go perfectly with the pumpkin ice cream. Once I reduced it I added light brown sugar and butter and let it bubble away till it got thick and syrupy. Then I added heavy cream and let it bubble away again till it reached the consistency I was going for. I got all the flavor I wanted and the light brown sugar cut the bitterness without making it too sweet. It turned out thicker than a normal caramel sauce and created this wonderful candy beer blanket over the ice cream. Have I lured you in yet?? The last component of this dessert is the gingerbread croutons, and well, they just make me happy. The sundae needed a crunch factor so I toasted up some of my sweet & sassy gingerbread. I told you I had something in store for the gingerbread! When you toast the little cubes of gingerbread they get unbelievably buttery. They’re kind of like fabulous fall sprinkles, and they definitely take the sundae to a whole new level. I recommend making a lot of these, they’re a great little snack, and they disappear very quickly! Enjoy the video! Bring milk, cream, brown sugar, spices, and salt to a boil over medium heat. In a separate bowl, whisk together yolks and sugar. Transfer mixture back to the pot and cook over medium heat for 2-4 minutes until the mixture thickens. Remove from the heat and strain. Whisk in pumpkin puree, vanilla, and bourbon. Once the custard has cooled to room temp refrigerate overnight. Add the custard to an ice cream machine and process according to manufacturer’s directions. It will take about 15-20 minutes. Store in a covered container in the freezer. Bring beer to a boil over medium heat and reduce to 1 cup, takes about 15 minutes. Add light brown sugar, butter, and salt to the beer reduction and cook 6-8 minutes until mixture is thick and bubbling. Slowly add heavy cream. Be careful, the hot mixture will sputter. Stir to incorporate cream and add vanilla extract. Bring back to a boil, reduce heat, and simmer 6-8 minutes longer till sauce gets really thick. Sauce can be made up to a week ahead of time and stored in the fridge till ready to use. Slice gingerbread and cut into cubes. Place on a parchment lined baking sheet. Bake at 350 for 20 minutes rotating once halfway through. Store croutons in an airtight container till ready to use. >Completely random sounding, like bacon-brownies, yet surprisingly works. Good one! I have never had beer caramel sauce, and I'm from Germany! Clearly, I have been missing out. This sounds really, really delicious & creative. >This looks stunning – and decadent. Love it. >Okay, this is just ridiculous. Absolutely freakin' ridiculous. You knocked my socks off!!!! My husband will LOVE the beer caramel sauce too! >Awesome creation here. You did not just stop with the ice cream, you added a lot of extra goodies on top-which makes for an elegant dessert. This is probably the best thing I have seen all day. I am impressed and so glad you posted this recipe! Have a great weekend. >Oh man, this looks like heaven in so many ways! The gingerbread croutons are such a nice touch. I sure wish I had a big bowl of this right now! >Yum! Beer caramel!? OMG. Talk about mouthwatering … this looks absolutely amazing! >That is so creative! Sounds incredibly delicious and perfectly seasonal…can't wait to try this one! >A very autumn dessert. Love it! >I like to go Gaga over kiddie sundaes but this adult one is making me seriously drool. I love every little bit of it. Thanks for sharing! >This is as innovative as it is delicious. Very interesting take on croutons, indeed! You've concocted a very impressive dessert here. >This is absolutely BRILLIANT! As soon as I read beer caramel I was hooked…and then gingerbread croutons? GENIUS! Really – this is amazing! I am happily stumbling this one! >What a creative combination of flavor. That's my kind of treat there! >This ice cream rocks! Great idea with the beer caramel and the addition of Bourbon. >As if pumpkin ice-cream wasn't enough, you had to add some caramel too. This dessert sounds and looks amazing. Very intrigued by the addition of beer. >Meghan-such a genius creative idea coming from you, the fabulous pastry chef, making beer/caramel/bourbon croutons to the amazing pumpkin ice cream, will be the best dessert for Thanksgiving! >Oh, my gosh, you've outdone yourself once again! These are stunning sundaes!!! Mmmmmmmmm. >I love your foodie imagination. I know when I open your blog, there's going to be yet another delight. Love the gingerbread croutons. Love the beer caramel sauce. Love the pumpkin icecream. Take a bow! >Yes!!! This is so perfect for the holidays! Pumpkin ice cream sounds amazing right about now! >Holy crap! This is amazing! No, this is beyond amazing! I would devour this in about 2 minutes!!! Love it! >I can't decide what's more awesome about this..the ice cream, the beer caramel, or the gingerbread croutons. It's all incredible! Buzzed! 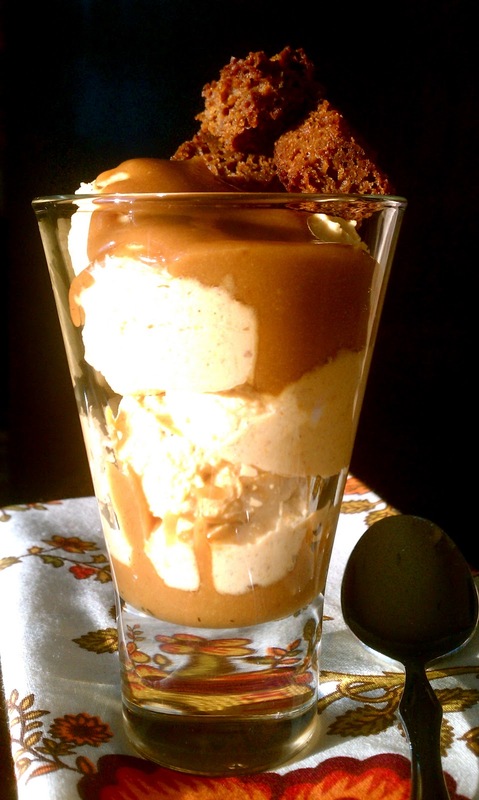 >Such a marvelous recipe and lovely presentation!The beer caramel sauce really sounds very new.Congrats on the Top9 – you have a lovely blog and I'm so glad to be following you! >Wow, this looks so good! Congrats on top 9, this one is a keeper! >This is making me dizzy!!!!! Fabulous stuff darlin'!! !Thank you so much for sharing. >This is lovely! Thank you! >Gingerbread croutons are an excellent invention!Just the idea of a crouton on a sundae rocks. >Another recipe I have to try… Bravo for making it to the Foodbuzz Top 9!! >I never would have thought about putting beer in caramel sauce, but I love the idea! This recipe is really creative, not to mention beautiful. >What an amazing combination of flavors! I would love to dive into one of these! >I'm usually not a big ice-cream girl, but this looks too good! Thank you for sharing such a tempting treat! And thank you for your kind words on my own blog. They meant so much! Blessings as the week unfolds. >Each ingredient on its own is amazing! This is one grown up sundae I could really dig into. Especially LOVE those gingerbread croutons! >Oh wow! This sounds so good! Love the gingerbread croutons! >I love the combinations in this. I'm working on a pumpkin soda, and love all things pumpkin this time of year. Thanks for sharing! >OOOH! I love this so much, what a great recipe! Original, and I never would have thought to do this! >I am addicted to your blog I guess because since I bumped here I don't leave it right away I browsed some of your recipe and will continue to browse it again and again…and I think this is one of my favorite recipe . caramel beer sauce – wow! and of course the ice cream itself and the croutons – sooooo creative!